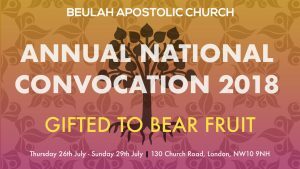 Beulah Apostolic Church UK present their Annual National Convocation for 2018. This year we are returning to some fundamental principles and will be exploring what could be termed some “core values” of Apostolic belief and doctrine. 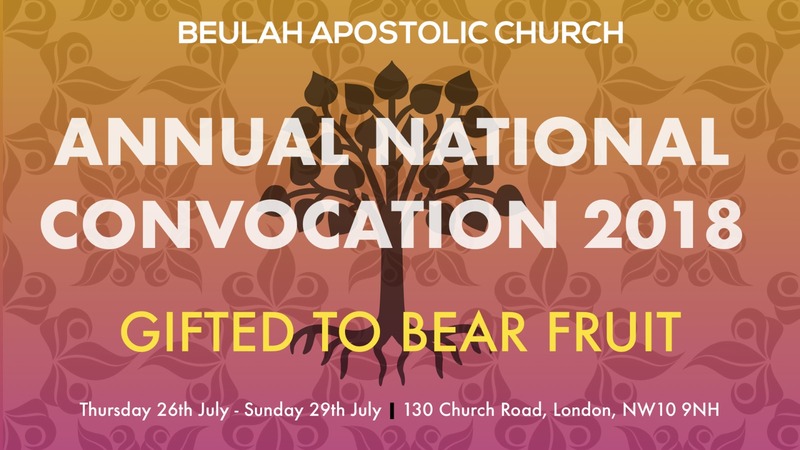 Our theme, “GIFTED TO BEAR FRUIT”, is concerned with the Gift of the Holy Spirit and the gifts which ‘HE’ gives to believers in order to empower their individual lives and to fulfil their purpose in the Body of Christ – the Church. Every Spirit-filled believer is given one or more gifts of the Holy Spirit for the expressed purpose of bearing spiritual fruit. With workshops and seminars in the afternoon sessions from 12 noon, praise and worship in the early evening from 6:30 pm culminating with focused expounding of the word in an anointed atmosphere, come expecting to leave gifted to bear fruit! Sunday morning begins at 10 am with a Sunday School session, followed by Sunday worship and a message for the organisation as well as the wider communities they serve.